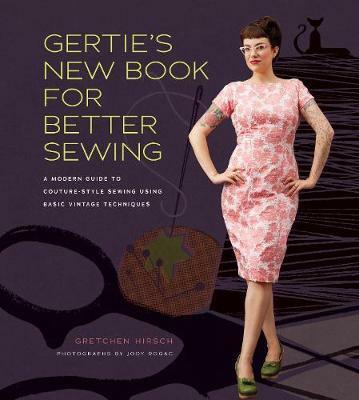 Gretchen "Gertie" Hirsch is a passionate home seamstress, an in demand sewing teacher and creator/writer of one of the web's most popular sewing blogs: Gertie's New Blog for Better Sewing. The blog began as a way for readers to follow Gretchen's progress as she made her way through all fourteen fashions from her favourite 1950s sewing book, Vogue's New Book for Better Sewing (a "Julie and Julia esque" experiment for the modern seamstress). It quickly became a place for Gretchen to share detailed sewing tutorials and spirited posts about sewing as it relates to fashion history, pop culture, body image and gender. An extension of the blog, Gertie's New Book for Better Sewing: A Modern Guide to Couture Style Sewing Using Basic Vintage Techniques is a hardworking reference book, packed with techniques our greatgrandmothers could have done in their sleep but have been forgotten over the decades, all shown in step by step photographed and illustrated tutorials. It is also a stylish, spirited pattern book featuring 14 customisable wardrobe essentials inspired by Vogue's New Book for Better Sewing, many shown in several different variations, for a total of 25 projects. Projects range from a pencil skirt and portrait blouse to a wiggle dress and suit jacket. All of the projects are modelled by charming Gertie, who has the proportions and curves of a typical modern woman, not a super model. Gretchen Hirsch is the sewing mastermind behind Gertie's New Blog for Better Sewing (blogforbettersewing.blogspot.com). She teaches sewing classes and contributesto many sewing publications. She has 15,000 blog subscribers and averages 45,000 unique monthly visitors and 350,000 monthly page views.